This is where we started – recognising that we are ALL individuals living in communities in a relationship with systems and decision-making structures which affect our lives. We were running a series of programmes for women to learn more about active citizenship and how they themselves could be more involved. At the same time, we were facilitating sessions with community groups, looking at what they needed to do to become more influential. It hit us like a brick that none of this is going to make any difference unless public bodies and agencies are open to that influence and understand the part that their own structures and systems play. This Venn diagram illustrates the links between these 3 parties (individual, community & state). However, clearly there is a difference in power between these different parties, and this will vary in different contexts. It is this understanding of differential power relations which underpins our approach to everything that we do. – and the connections with all of these and what voluntary sector organisations do – what community groups do – and how we all work together. What we have is: a load of individuals (citizens in the diagram above) – who need to know how to talk to each other, how to consider each other, who want things to change and who believe that they can play a role in that change. Then we have voluntary sector organisations – and community groups (‘communities’ in the diagram above) – who need to know how to talk to each other and how to talk to their own staff and volunteers, who understand that what they do affects and impacts on others. They also need to represent people properly and know who their members are. Then we have the Council (or it might be the Foundation Health Trust, the Police, Housing Association, Clinical Commissioning Group …. 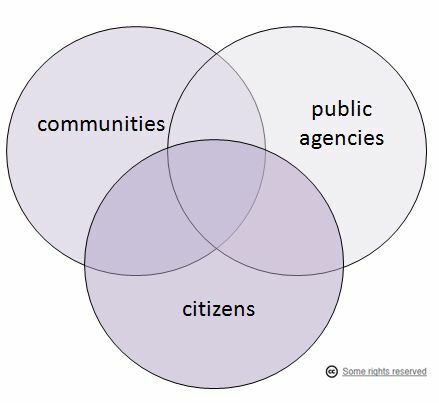 any ‘BODY’ which makes decisions – they are the ‘public agencies’ in the diagram above) – who need to know what is going on, how to communicate with their own staff and how staff communicate with each other. Their staff need to be able to take decisions and respond to needs, they need to know what other people are doing, where their bit fits and how what they do impacts on others. 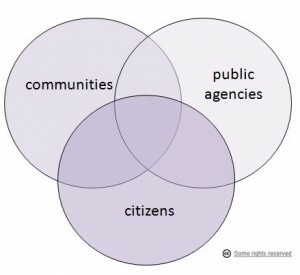 AND – we are all a bit muddled up – people who work in agencies are also individuals, they live in communities and take part in different activities; we have all had different jobs, perhaps in different sectors and bring unknown knowledge and experience into the relationship. ALL of this is going on and the diagram is about making sense of it, recognising the relationships between these parties and helping us to do something about it – so that something changes!!! Interested in why we developed this approach?